Join me as I go on a mystical journey on the back of a giant turtle, learning the ways of the new Monk class, the ways of the Pandaren race, and how strange it is to play a melee character in World of Warcraft without an auto attack. Blizzard may take forever to finish their games, but when they announce one they make damn sure they've got something playable to show for it. That's how I got my paws on one of Mists of Pandaria's Pandaren Monk for an hour this morning at BlizzCon 2011. 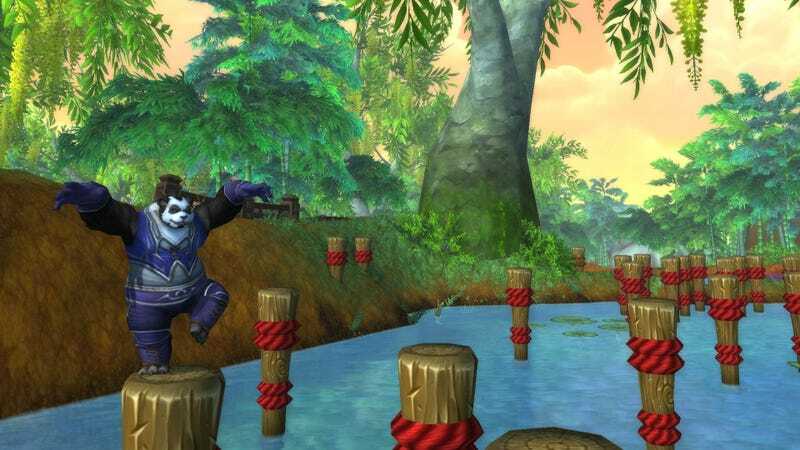 I've often said the journey of a thousand miles begins with character creation, and in the case of the Pandaren demo at BlizzCon that's a very limited beginning. Since female pandas are currently just male pandas with labels over their heads that say "I'm a Girl", the only real option I had was deciding my Monk's name. Eager to get into the action, I chose my default trade show MMO character name. Crecente the panda came to life in the Pandaren starting zone of The Wandering Isle, so named because it's built on top of a gigantic turtle. The first thing I did was type '/dance'. Sadly, nothing happened. The Monk class starts with two skills at level one. Jab is a basic attack that uses the regenerating Chi resource, the Monk equivalent of Rogue energy. Using Jab generates light and dark energy, represented as four dots on either side of an Asian dragon-styled interface element. These dots are used to power advanced martial arts techniques, like the second starting skill, Tiger Palm, a more damaging attack. These skills are put to the test during my second quest (the first merely involved fetching a pair of handwrap fist weapons from a rack), in which I was tasked with beating up some training dummies. I walked up to one, clicked it, and nothing happened. Oh yeah, no auto attack. How odd. Where other melee World of Warcraft characters can simply click on an enemy to automatically begin attacking, the Monk can only initiate an attack by using a skill or ability. It feels odd at first, but later in the demo I began to get skills that helped shed light on the reasoning behind the choice. Around level four or five I earned a darkness-fueled kicking skill that replenished a point of dark power if I killed an enemy with it. That's a task made much easier when you don't have to worry about an auto attack futzing with your rhythm. I imagine Monk players will be extremely busy during combat as they get up in levels; at least the good ones will. A series of quests led me across a distinctly Asian-flavored land, filled with serene majestic temples, mystical caverns, calm, tranquil waters, and monkey creatures that jump on your back for no damn reason. No, seriously, I was on a quest to repel monkey-creature invaders from a village, and one of the monkeys leapt onto my back, clinging to me as I killed his companions. For one brief, shining moment I was a panda with a monkey on his back, and I understood the mystical balance of all things. The balance of all things plays a large part in this opening story, steeped in ancient wisdom, focused on the spiritual and the elemental. It was at once familiar and foreign. One moment I was performing a standard gather X number of Y quest, the next I was battling other Monk students while balanced on wooden poles, or chasing the playful Spirit of Water across a pond, playing tag. Or fighting the most adorable little bunny creatures away from a farmer's carrots. I really wish I had a picture of these Vermind (I believe that's what they were called). They're the next Murlocs, mark my words. The familiar and foreign theme carries over to the Monk class as well. With their Chi energy and the light and dark dot mechanic they felt like Rogues initially, only with outrageous rolling about instead of stealth. Once I earned the Flying Tiger Kick, the Monk version of a Warrior's Charge skill, I began to see how they might function as a tank. Unfortunately the choice between healing, DPS, and tanking (as well as Alliance or Horde) doesn't happen until level ten, and I had to stop at seven. There is much promise here, in this ancient Asian land, where the pop culture references turn from sci-fi fantasy to kung fu movies and comic book martial artists; where the battle between the Alliance and the Horde isn't as important as the battle for inner peace and tranquility. I feel sad, knowing that war will soon spill over into this untouched land, but I get the impression Crecente the Panda Monk will be able to handle anything they throw at him.